Struggling to get a good night’s sleep? The solution for your insomnia is now here and it comes in the form of these hypoallergenic, 1,000-thread count Egyptian cotton sheets. The Bamboo Comfort 6-Piece Luxury Sheet Set is everything you need to start sleeping better tonight. There’s nothing like silky, soft sheets to ensure that you’ll fall asleep faster and stay asleep longer! 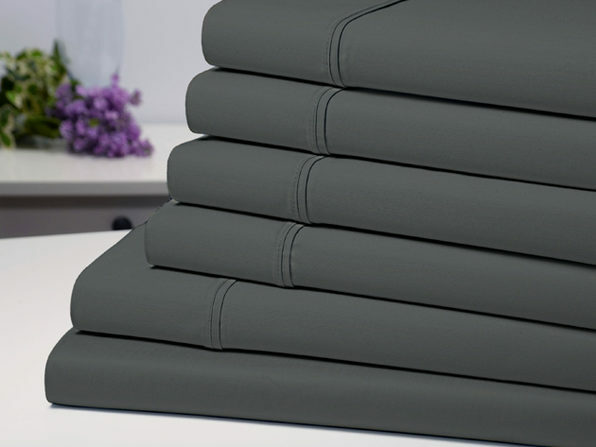 The Bamboo Comfort 6-Piece Luxury Sheet Set is not just your regular, scratchy set of sheets. These silky, soft sheets have been designed to optimize your precious beauty rest. Each piece in this luxury sheet set is constructed out of 60% high-quality 90gsm microfiber and 40% bamboo fiber. This is the ideal combination of comfort, fashion, and breathability. Included in the Bamboo Comfort 6-Piece Luxury Sheet Set are 4 pillowcases, 1 flat sheet, and 1 fitted sheet. It’s designed to outfit mattresses up to 16” thick. Unlike many other sheets, these ones will provide long-lasting vibrant colors even after many washes. Choose between 5 beautiful colors: Grey, Ivory, Sage, White, Taupe. From the organic fabric to the wrinkle-resistant design, the Bamboo Comfort 6-Piece Luxury Sheet Set is perfect in every way. Get started on your journey to a better night’s sleep today. Originally, this sheet set was 67% off, but be sure to use the limited-time coupon, MERRY15, for an additional 15% off. That brings your total down to $33.14!